Will you dare the Hollows of Perdition? 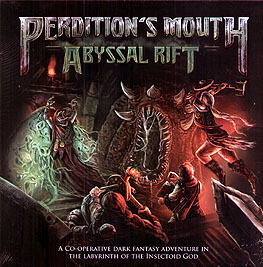 The dark, unforgiving road through perdition leads to the Abyssal Rift, where the secretive Cult of Change is summoning a long dormant demon. Should they succeed, the demon aims to end the reign of men. "The way the rondel worked, the unique feel of each hero, and the gritty horror fantasy theme all appealed to me, as there was nothing else like it on the market. ...I think this is a real winner!" Game designers Timo Multamaki, Thomas Klausner, and Kevin Wilson set out to implement a new kind of dungeon crawl that embraces the European school of game design, emphasising strategy and cooperation while minimising luck. No gamemaster - and no dice! Your fate is your own.